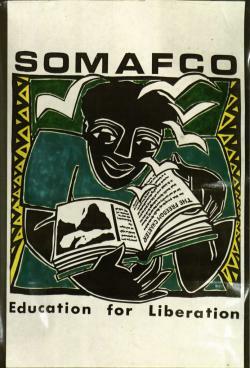 Poster about the Solomon Mahlangu Freedom College (SOMAFCO). 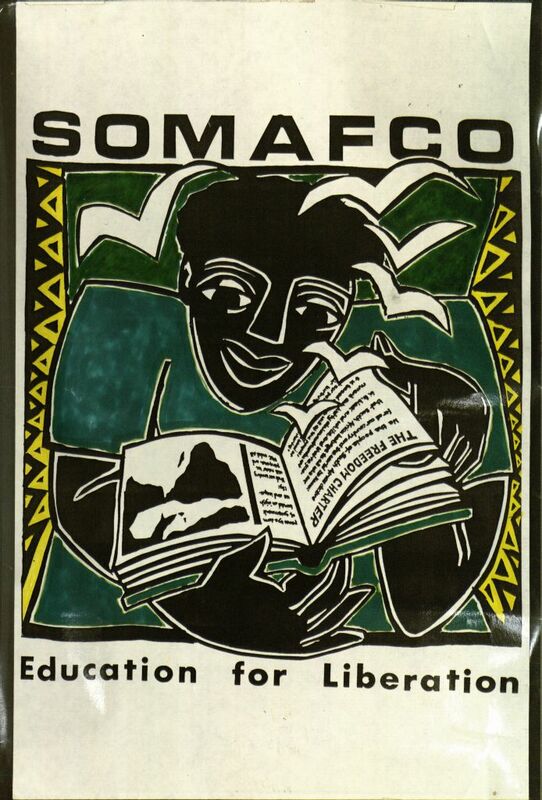 SOMAFCO was established by the African National Congress (ANC) in Mazimbu, near Morogoro, Tanzania for South Africa youth in exile. It first enrollment of students was in 1978. The school was renamed after Solomon Mahlangu, a member the ANC, shortly after his execution in by the government of South Africa 1979. Mahlangu was a student in South Africa who went into exile in the aftermath of the Soweto Uprising in 1976. He joined armed wing of the African National Congress (ANC), Umkhonto we Sizwe (MK), the Spear of the Nation and returned on a mission in 1977. SOMAFOC continued until just after 1989. (Source: the ANC website.) Size: 11 x 16.75 inches.